The curtain goes up: Dax Stokes kicks off “There Are Such Things! 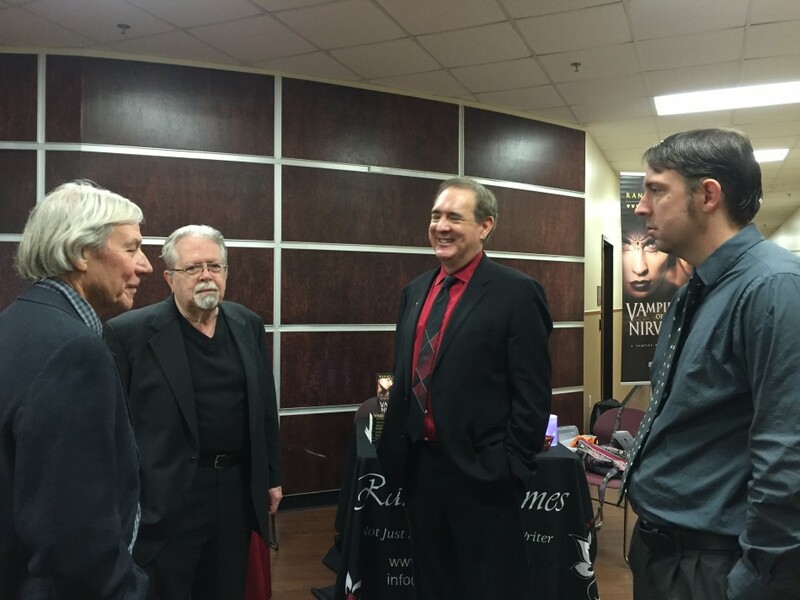 Vampire Studies Symposium 2015” at North Central Texas College, Corinth, on Oct. 31, 2015. Picture: Erin Chapman. 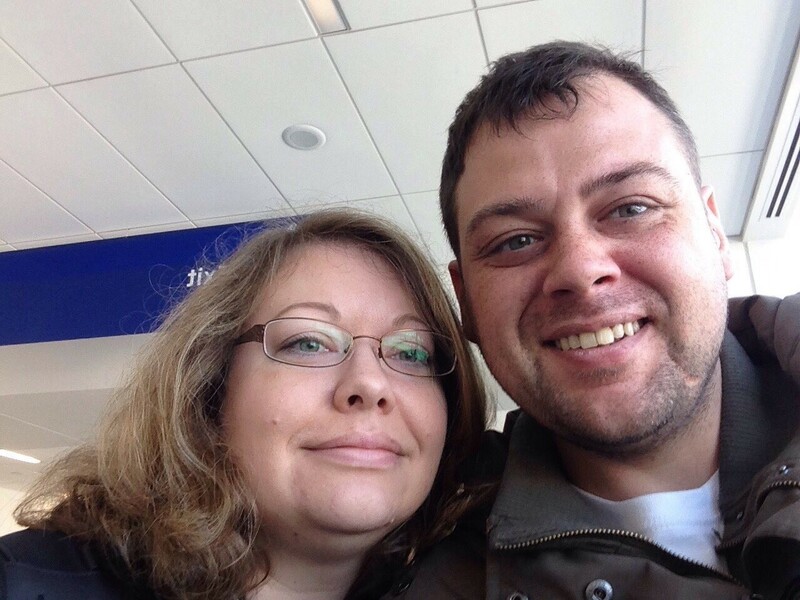 On Oct. 30, 2015 my other half and I flew from Vancouver to attend “There Are Such Things! 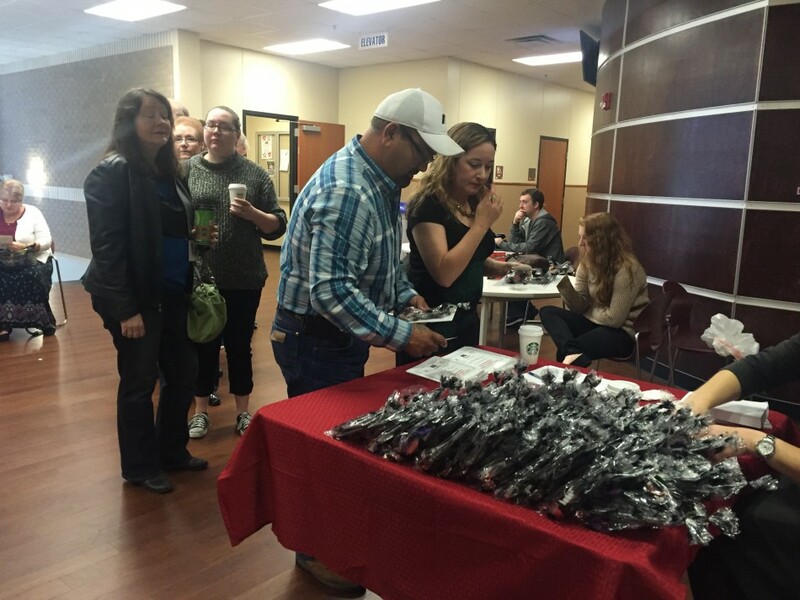 Vampire Studies Symposium 2015” for Halloween at North Central Texas College in Corinth, Texas. The border security officer at Vancouver International Airport asked the purpose of our trip. I said: “Attending a vampire conference in Texas.” I was expecting a puzzled look, but he wasn’t fazed and waved us through. Before boarding, we picked up some breakfast at Starbucks. I also bought a bottle of Gibson’s Whisky from the duty free shop for Michael Bell, one of the symposium speakers, because he graciously offered us accommodation at his house for part of our trip. We stopped at Salt Lake City International Airport for a connecting flight to Dallas/Fort Worth International Airport. The flight arrived on time and we had two hours kill, which I spent watching passengers at the gate. People with southern accents are rare in Vancouver; listening to them discuss real estate and American football, loudly, was unusual. My people watching was interrupted by a familiar voice making airport announcements; it was the voice behind Apple’s Siri, Susan Bennett. Prior to boarding, the airline made an announcement: our flight would be a bit delayed due to extreme weather, which we would have to fly around—Texas was being bombarded with tornadoes, harsh rains and floods. I texted Anthony with an update. I also received a text message from Dax Stokes, the symposium’s organizer, telling me that two of the speakers couldn’t fly into Dallas due to airport closures in Atlanta (where Joseph Laycock was flying in from) and Austin (where Thomas J. Garza was). They were trying to find alternative routes. This news stressed me out because we only had five speakers, total, for the event. Missing two from our panel would not go over well with attendees. During the flight the turbulence was pretty bad. It was the worst I have ever experienced and I couldn’t imagine what would have happened if those two speakers had boarded a flight that afternoon. We landed in Dallas at 3:30 p.m. and surprisingly check out took only about ten minutes. No customs checks like in Vancouver; we just grabbed our bags and popped out the front door. I was amazed at the lack of security. We hopped on an airport shuttle to the rental auto-mall to pick up our car. I managed to get a discount after a brief chat with the salesman. 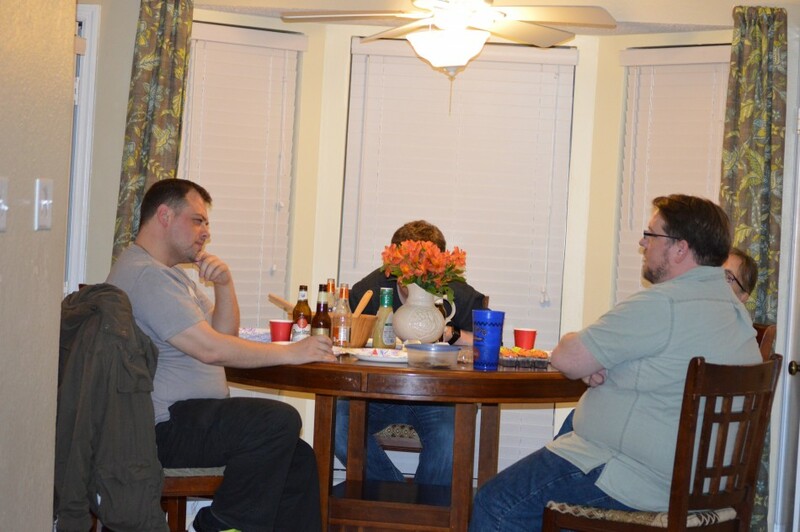 We loaded up a black Ford Focus with our bags, and drove to Michael Bell’s house. Breakfast before the big day: Michael and Anthony chatting at Michael’s table on Halloween morning. Picture: Erin Chapman. I’d never used the Google Map app on my phone before and we got a little “misplaced” on our way, but eventually made it. Their highways were totally different from what we are used to in Vancouver. I texted Anthony when we were outside Michael’s house. It was pouring rain and I had to knock on the door to find out where to park. I was greeted by Michael, Anthony, and Michael’s dogs Daisy (poodle) and Morgan (golden labrador). This trip was an important milestone, not only for the symposium, but because it was the first time Anthony and I were going to meet in person. We’ve known each other two and a half years and only talked online or by phone. We stood outside in the rain while my boyfriend parked the car. For the first few minutes, it felt a little awkward and surreal seeing Anthony in the flesh, but then I gave him a hug and everything was good. Michael and his wife, Carole, were very hospitable and friendly. Me and my other half stayed in the spare room while Anthony took Michael’s study. My first order of business was to unpack treats that I had brought along. I gave Michael his whisky and Anthony a stuffed vampire Minion with a plush vampire trick or treat bag. Anthony told me how Halloween wasn’t a big holiday in Australia and had only been trick or treating once as a kid and it was unsuccessful. I figured he would appreciate some tasty treats from Canada for the holiday. I also brought him a stuffed bat which I picked up for him at Okehampton Castle during my visit to the UK last year. Anthony and I chatted for about an hour before all of us headed over to Dax’s place for a pre-arranged get-together. On the way, we made a stop at Total Wine & More Plano East, probably the biggest liquor store I have ever been to. We picked up some Iron Maiden Beer, Pilsners and Apple Honey Strong Bow ciders. Standing beside Anthony in line, I joked with him and said I expected him to be taller. It was nice to meet Dax in person as well as our keynote speaker, J. Gordon Melton, who was already there when we arrived. Everyone got along and we had the chance to hang out for a few hours. Dax had to leave at about 9 p.m. in hopes of picking up our two missing speakers at the airport. Chilling at Dax’s place: Anthony, my other half, Carole and Dax enjoying food and conversation. Picture: Erin Chapman. We drove back to Bell’s place and had some more drinks. The local news showed some areas of Texas were under two or three feet of water. Despite being tired, it was fun to hang out with Anthony as we assembled goody bags in Michael’s living room that I had brought over for the symposium. Everyone went to bed about midnight because we had to get up at 6 a.m. to get ready for the symposium. I woke up just before six to find Anthony really stressed: due to his jet-lag, he hadn’t sleep at all. I assured him I would be his wingman for the day and everything would be fine. While we were talking, I had one of my random nose bleeds. Not sure if it was related to allergies (I’m allergic to animal hair) or change in altitude; either way, not the best start of the day for me. Everyone had cheese bagels for breakfast. 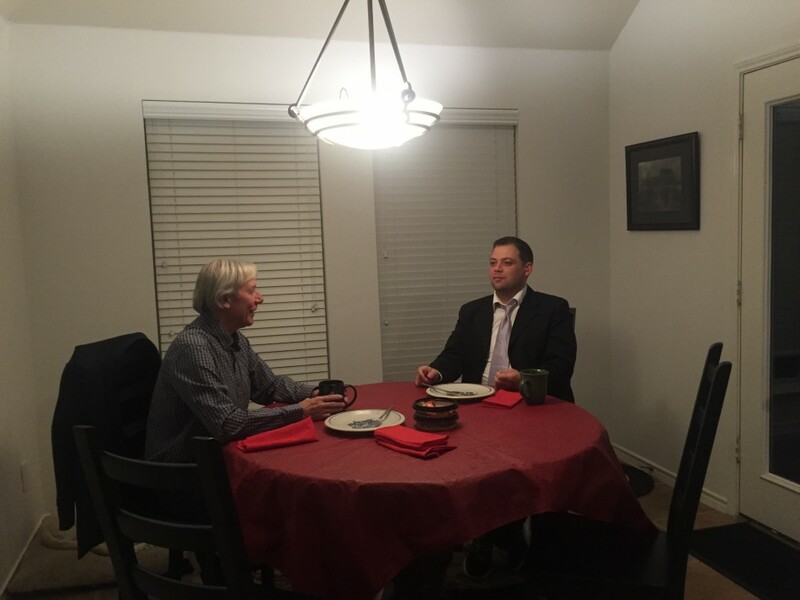 It was great to see Anthony shooting the breeze with Michael; they were both totally in their element. Early risers: Symposium attendees at the registration table. Note goody bags—prepared the night before at Michael’s place. Picture: Erin Chapman. The three of us followed Michael to North Central Texas College in the rental car because we were going to our hotel after the event. We arrived by 8:30 a.m., just as attendees were starting to line-up. Speakers talking: Michael Bell, J. Gordon Melton, Thomas J. Garza, and Joseph Laycock chat before the symposium starts. Picture: Erin Chapman. We got Anthony some well needed coffee, set up our camcorder, grabbed a front row seat and settled in to listen to what the speakers had to say. 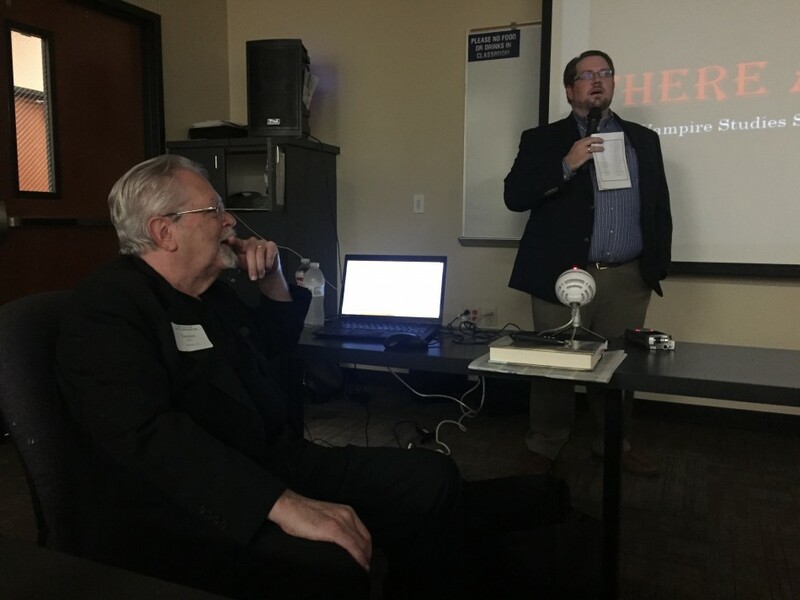 Before kickoff: Keynote speaker, J. Gordon Melton, listens on as Dax Stokes introduces the symposium. Picture: Erin Chapman. During the lunch break my other half bought me a couple of books from Gordon (as Melton prefers to be called): The Vampire in Folklore, History, Literature, Film and Television: A Comprehensive Bibliography (2015), the third edition of The Vampire Book: The Encyclopedia of the Undead (2011) and the condensed version of that book published in 2014. Gordon was kind enough to autograph all copies. After the symposium, we had a chance to mingle with the speakers at Angelina’s Mexican Restaurant near the college. The food wasn’t that great and their vegetarian options were minimal—which was a problem for me and Anthony because we are both vegetarians. 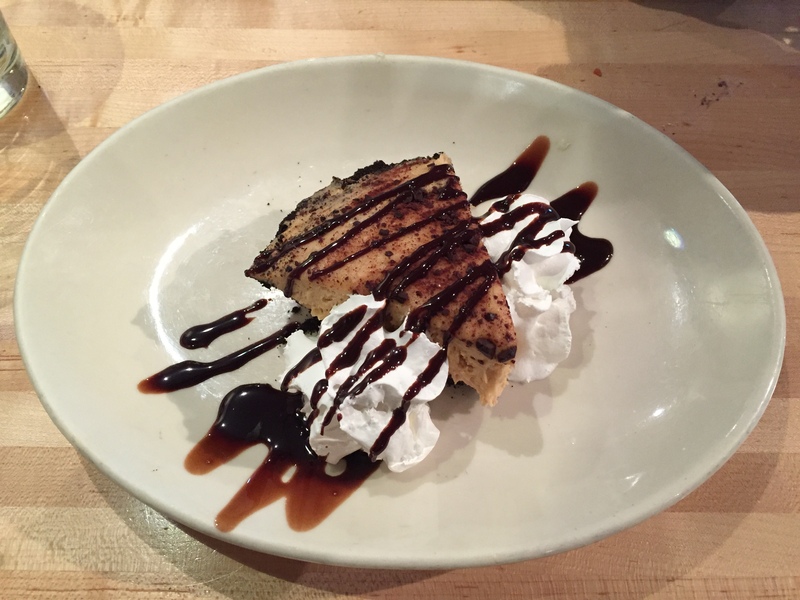 The highlight of the meal was when Anthony and I shared something I have never tried before: Fried Ice-Cream. Being lactose intolerant, I mostly ate the crunchy outside while he took care of the ice-cream middle. Anthony wasn’t able to finish the ice-cream because everyone had to leave. 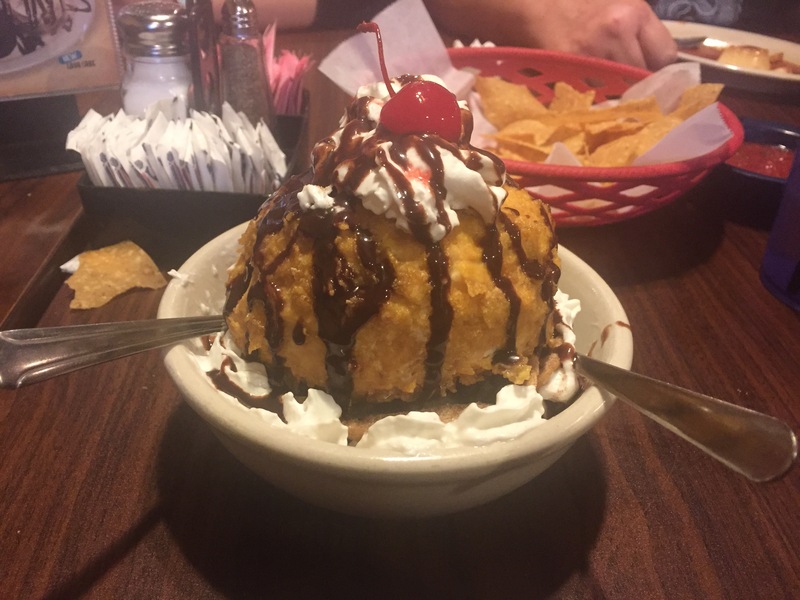 The unconquered meal: Fried Ice-Cream at Angelina’s Mexican Restaurant. Picture: Erin Chapman. Everyone said their goodbyes; Michael headed home, and Dax had to drop Joseph and Thomas off at the airport. Before driving to our hotel, me, Anthony and my other half made a detour with Gordon to a giant used book store in Denton called Recycled Books, Records, & CDs. I bought some books Anthony recommended: Katherine Ramland’s The Science of Vampires (2002), Rosemary Ellen Guiley’s The Encyclopedia of Vampires, Werewolves and Other Monsters (2005), and J. Gordon Melton’s The Vampire Gallery: A Who’s Who of the Undead (1998). Meanwhile, I bought Andrew Fox’s Fat White Vampire Blues (2003) on Gordon’s recommendation. I had to limit myself any more due to luggage space. Anthony was in the same position. He went wandering and came back with an armload of books; I had to cut him off from buying any more. We saw Gordon off at the bookshop and drove to our hotel, the Comfort Inn & Suites Love Field-Dallas Market Center. We checked in and then walked up the street to Bombshells Dallas, an airforce-themed bar, for some well-deserved Halloween drinks and fun. There was loud music, women serving drinks in scantily dressed Halloween costumes and, compared to Canada, very cheap booze. Anthony and I each started with a Witch’s Brew; a giant fishbowl style green drink with a blue test tube of Blue Caraco sticking out and gummy bears submerged in its murky depths. My other half was less adventurous and stuck with a pints of Budweiser. Anthony and I shared some Locked and Loaded Cheese Fries while my boyfriend got some B-17 Wings (chicken wings). The sauce they’d been cooked in was so insanely hot, he couldn’t eat more than two of them. This was a first as he loves spicy food. The three of us headed back to the hotel about one in the morning, but made a quick stop at a nearby Jack in the Box. Having never been to the States before, we wanted to give Anthony a taste of American fast food. Plus, we were all tipsy and had the munchies. I had a grilled cheese sandwich and shared some onion rings and Texas Torpedos with Anthony. Back at the hotel the boys had a few more beers. I knew it was time for bed when Anthony dozed off in the chair and my boyfriend was passed out on the bed. We had a big day ahead of us tomorrow and needed our sleep: we were going to visit J. Gordon Melton and to find a supposedly authentic antique vampire killing kit. Even our breakfast drinks were vampire-themed: Anthony and I ordered Frappula Frappuccinos at Starbucks; Anthony’s is the one with “Boo” written on it. Picture: Erin Chapman. We had a quick self-serve breakfast of pink waffles, toast, and eggs at the hotel, but had to make a stop before our long drive at Starbucks. A couple of days before I had come across an article mentioning a Halloween promotion they were doing: a vampire-themed frappuccino. Being lactose intolerant, I opted for the smallest one possible so you can guess which one is Anthony’s. The drinks were enjoyed during our two hour drive to Waco to visit Melton. The Dracula wall: Anthony and Gordon stand in front of Gordon’s extensive collection of Dracula editions. Anthony is holding a 2012 facsimile edition published by Constable. Picture: Erin Chapman. 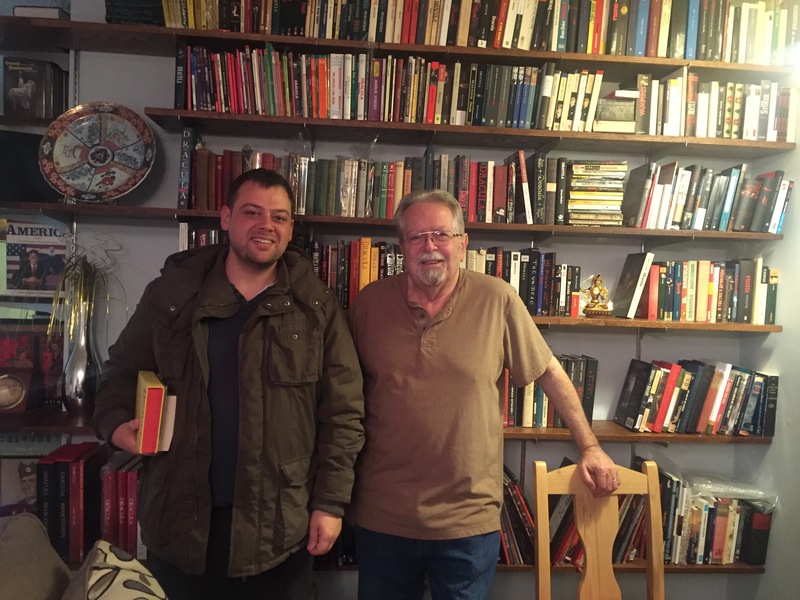 Gordon had invited us to his house to see his world renowned vampire book collection. Amazing is a total understatement. We got a tour of his collection that comprised of his entire house. Room after room was filled floor to ceiling with books, movies, comics, and various vampire goodies. Vampire books as far as the eye can see: The white boxes are filled with vampire comics. Picture: Erin Chapman. The three of us had a good chat after the tour. I was impressed by how personable he was with two people he had only recently met. One born every minute: Ripley’s Believe It or Not! 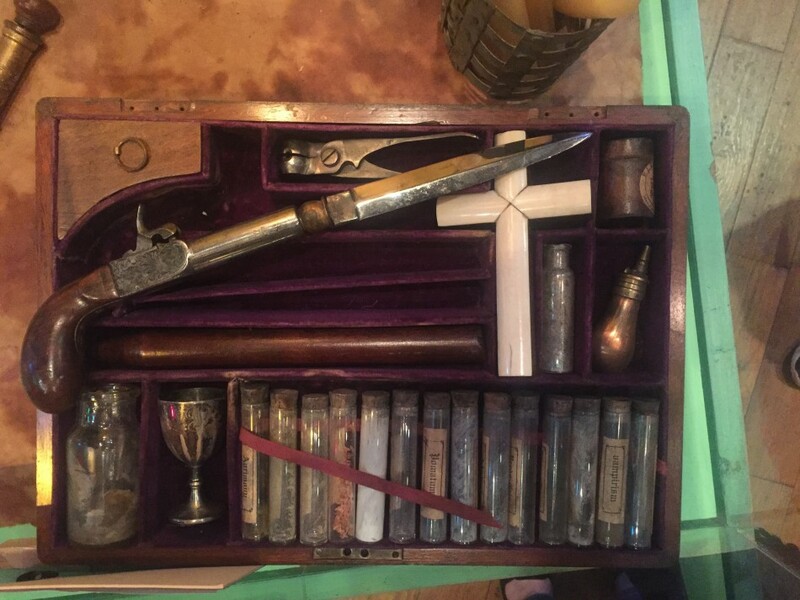 Grand Prairie’s “Genuine Vampire Killing Kit circa 1840.” Picture: Erin Chapman. We made it to the museum by 5 p.m., which left us only an hour to scope out everything. 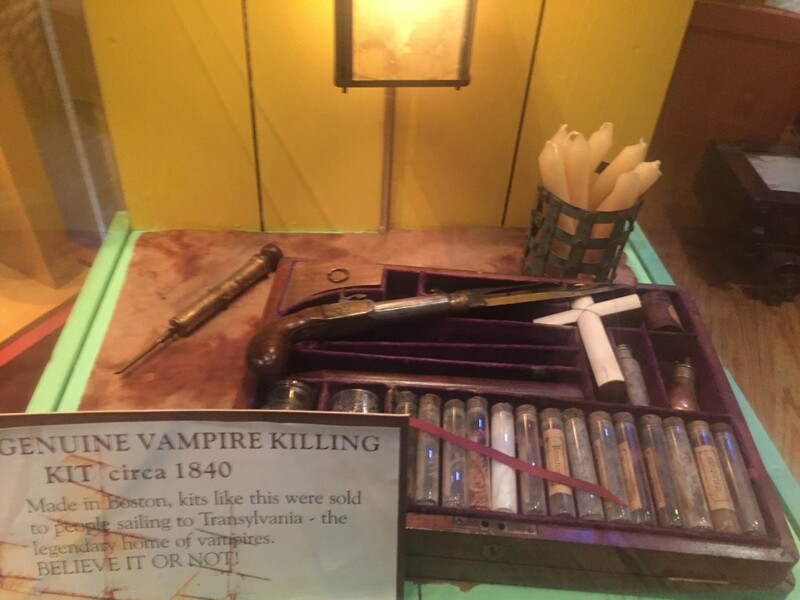 Our primary mission was to find the “genuine” vampire killing kit they had on display. We found it at the entrance to the Odditorium. Neither of us had seen one before so this was a big deal. Anthony, being an expert on the subject, wanted to ask some questions regarding the kit’s authenticity. We sought out an employee and Anthony asked if we could speak with the museum’s curator. The girl looked totally confused by the request. I asked if we could talk to a manager instead and again she looked puzzled. At this point I knew there was no point continuing the conversation. Vampire Killing Kit contents: Overhead shot of kit display. Picture: Erin Chapman. The wax exhibits were a blast. Having never seen any before, I was expecting them to look more real. The three of us got some great photos with famous actors, singers, political figures and superheroes. 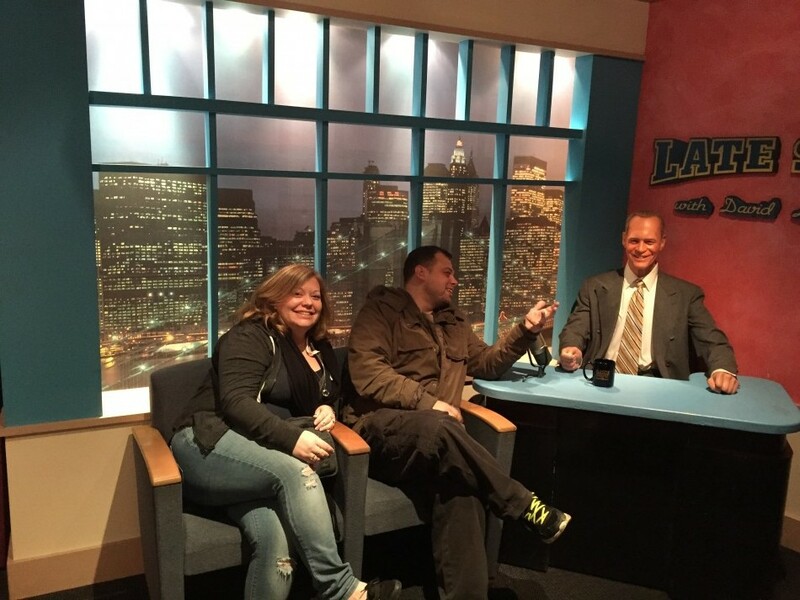 Cracking the big time: Vamped’s administrators on the Late Show with David Letterman. He seemed a little stiff. Picture supplied by my other half. 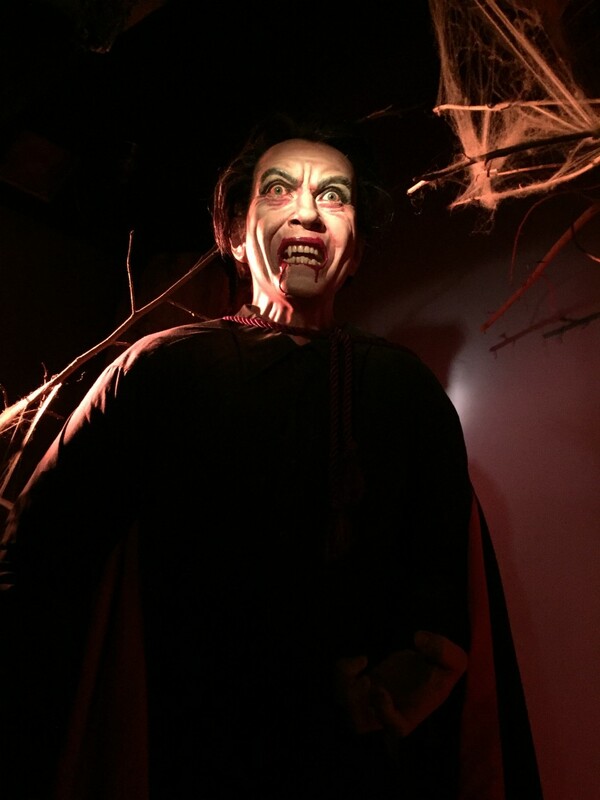 The special Fright Works exhibit was full of intense horror goodies. It had super loud music, eerie sound effects, and flashing lights for a total immersive experience. My ears actually hurt by the time we made our way through the maze, but I did manage to find a couple of vampires. We had a few minutes before closing to check out the gift shop. I picked up a two-headed stuffed turtle for myself and a Texas fridge magnet for my other half. He likes to collect them. Anthony got into the Texas spirit with a cowboy hat. Dinner time: We tried some good ol’ Texas bbq and vegetarian goodies. Picture: Erin Chapman. My boyfriend wanted to try some Texas BBQ before we went home. I did some research before our trip and found a place that had good reviews and offered vegetarian food that Anthony and I could eat. My search led us to Peggy Sue BBQ. I loved the 50s music that was playing and the casual vibe of the restaurant with old photos on the wall. It was a very nostalgic place and the dishes reminded me of an old school mom and pop diner. 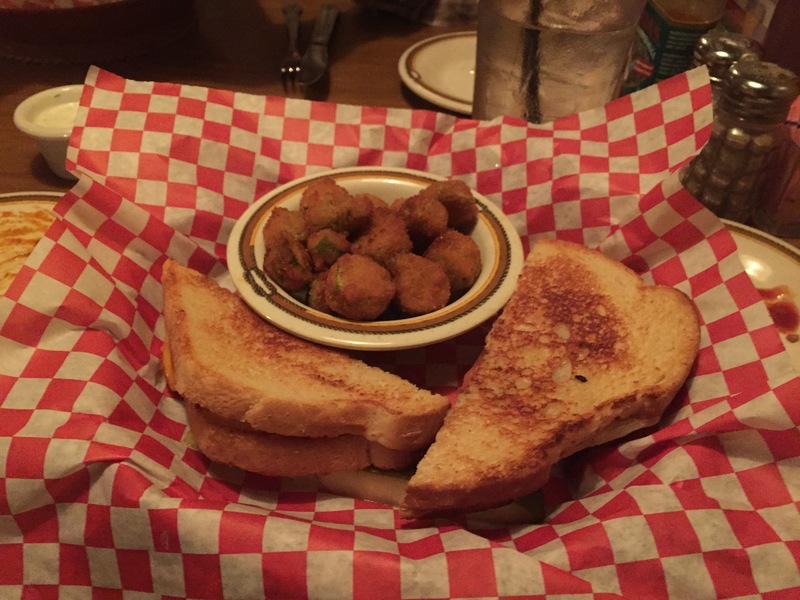 I had a sourdough grilled cheese sandwich with a side of deep fried okra. My boyfriend had a pulled-pork sandwich that he said was tender and had amazing bbq sauce. Anthony had the grilled cheese too with a side of fries. We all shared some onion rings and torpedos again, which seem to be offered everywhere down there. My dinner: grilled cheese and deep fried okra. Picture: Erin Chapman. I tried peach cobbler for dessert. Anthony had a root beer float and apple pie that wasn’t really authentic apple pie, which was the only disappointment. It was more a deep fried pastry as opposed to a baked pie, which me make at home. I was hoping he could try something very American. We drove back to the hotel after dinner and hung out for a bit longer. We had to get up early to catch our flights back home and return the rental car on the way to the airport. Goodbye selfie: Saying “see you later” at Dallas airport. Picture: Anthony Hogg. In the morning, I had to play Tetris with my books in my luggage to make sure everything fit and I was underweight. We stopped by Anthony’s room to pick him up and he was having packing challenges with his books too. I helped him split them up between his carry-on and suitcase and he was good to go. We returned the car, which cost $450 USD (plus $40 in toll fees and this was with a 10% discount). I was blown away at the final price because we have rented in England and Canada and usually that amount covers a week, not just three days. We arrived at the airport with lots of time to spare and realized Anthony had a different departure gate from us. We checked him in electronically and sat down for a final few moments and checked out all my photos from the trip. It had been a fun, memorable weekend that went by too fast. I was sad to see Anthony go. Besides my boyfriend, he is one of my closest friends. I had to hold back the tears when we said our goodbyes and hugged. I always tend to cry with goodbyes, I can’t help it. I even cry when I leave my turtles at my mum’s for babysitting before a trip. I managed to hold off the waterworks till my boyfriend and I were in line at security. For me, it’s the not knowing when or if you will see someone again. I had issues with security because I forgot my camera’s SD cards in my pocket from the symposium. They took the cards and said I had to claim them somewhere else. I was stressed out while I waited for a good five minutes and no one returned them. Had to go to a special counter and ask for them back. My boyfriend and I stopped in a few souvenir shops to kill time before eating lunch. I picked up some Texas Rattlesnake Poop (chocolate sunflower seeds) and fancy Texas hot sauces. For lunch he had a burger at Wendy’s and I tried a tofu stir fry from Genghis Grill next door. Anthony text me a photo of his lunch; he had discovered a very American shop, Dunkin Donuts. Nachos from hell: Messy, but tasty. Picture: Erin Chapman. We made it to Salt Lake City International Airport and had a four hour delay for our next flight. 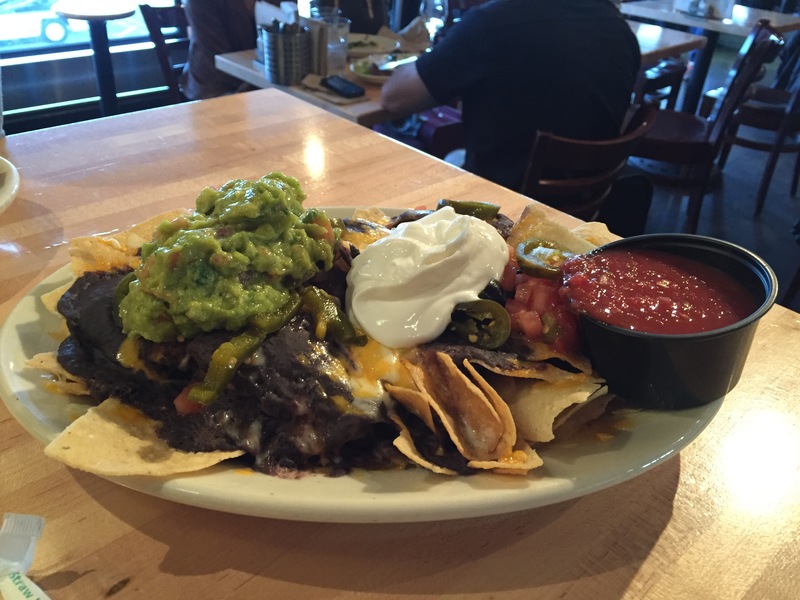 We stopped for dinner in a pub called Squatters Airport Pub and I had the world’s messiest nachos ever. I purposely didn’t finish my nachos and left room for a dessert. Something I had never seen before, which seemed to be a common occurrence of this trip: Peanut Butter and Chocolate Cheesecake. A match made in heaven: Fluffy peanut butter flavoured cheesecake with a chocolate crust I picked off. Picture: Erin Chapman. After eating we waited at the gate for our Vancouver flight. I spent the couple of hours sending out emails and browsing on Facebook. Anthony texted me his flight had been delayed a few hours and he was finally leaving Texas. The two hour flight went by fast as I spent the entire time making notes for this article. We landed in Vancouver about just after ten at night and caught a cab home after witnessing an old lady smash into another car in the cab line. As we drove home, I reflected on the weekend. Overall I felt very accomplished: I attended a vampire symposium we helped organize, I met some amazing authors in person, picked up some books for my collection and got them autographed, learned a lot about vampire folklore, saw a vampire killing kit, had fun in a wacky museum, ate some good food, got a tour of one of the largest vampire book collections in the world, and met Anthony in person. My boyfriend and I are planning an extensive trip to England and Dublin for the Transylvanian Society of Dracula Conference on Oct. 20 and 21, 2016. Plus there may be some more “Seeking Vampires in London” up my sleeve while we are in the UK. Stay tuned! during my visit to the UK last year: Erin Chapman, “Back to Britain: My Second Search for Vampires,” Vamped, Nov. 21, 2015, accessed March 29, 2016, http://vamped.org/2015/11/21/back-to-britain-my-second-search-for-vampires/. listen to what the speakers had to say: Erin Chapman, “I Attended a Vampire Symposium on Halloween. 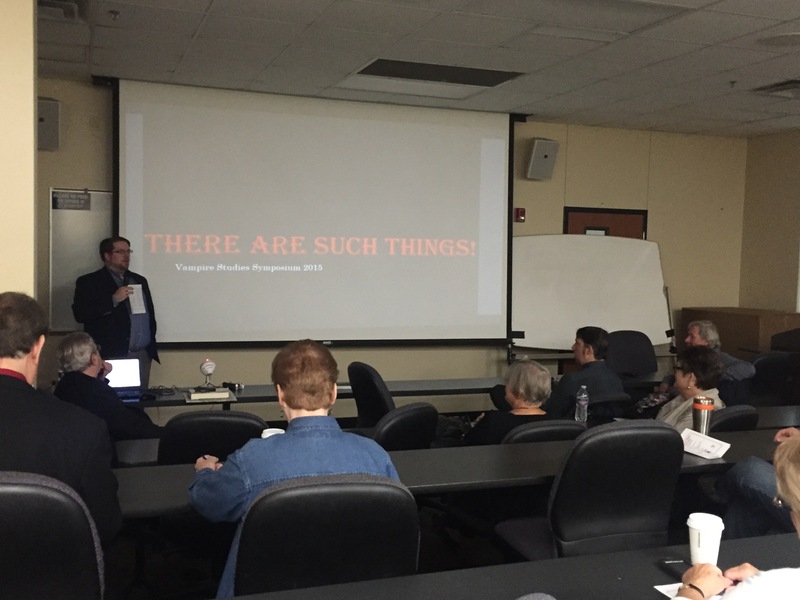 Here’s What I Learned,” Vamped, Dec. 23, 2015, accessed Feb. 29, 2016, http://vamped.org/2015/12/23/i-attended-a-vampire-studies-symposium-on-halloween-heres-what-i-learned/. 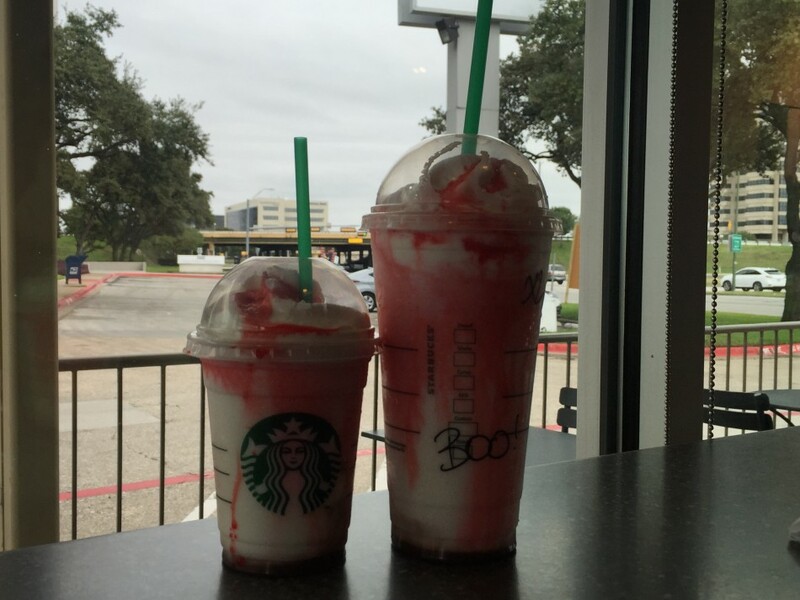 an article mentioning a Halloween promotion they were doing: Helin Jung, “Starbucks Just Released a Limited-Edition Halloween Frappuccino,” Cosmopolitan, Oct. 26, 2015, accessed Oct. 26, 2015, http://www.cosmopolitan.com/food-cocktails/news/a48170/starbucks-halloween-frappula-frappuccino/. archive.is link: http://archive.is/mY51q. 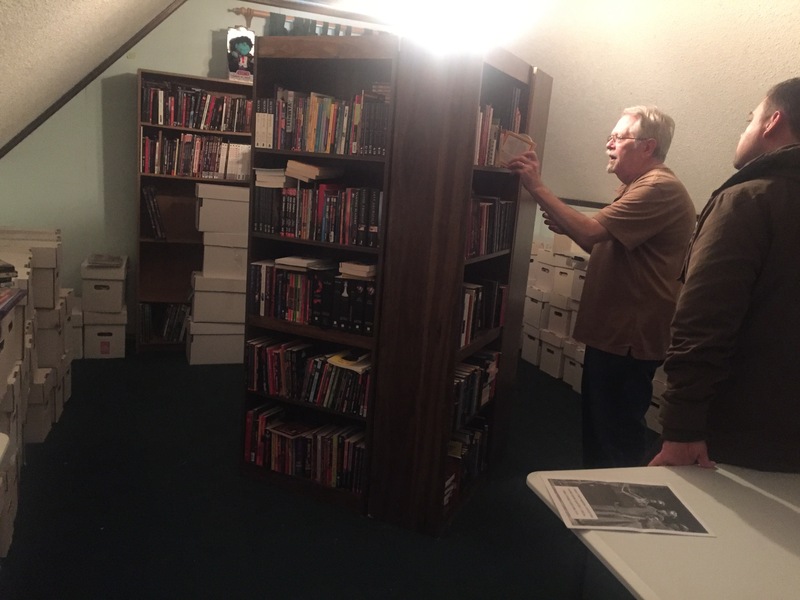 world renowned vampire book collection: Dax Stokes, “How I Spent Spring Break: Vampire Historian Meets Vampire Scholars,” Vamped, April 23, 2015, accessed March 7, 2016, http://vamped.org/2015/04/23/how-i-spent-spring-break-vampire-historian-meets-vampire-scholars/. being an expert on the subject: Anthony Hogg, “6 Reasons You Should’t Buy an Antique Vampire Killing Kit,” Vamped, Oct. 31, 2014, accessed March 18, 2016, http://vamped.org/2014/10/31/6-reasons-why-you-shouldnt-buy-an-antique-vampire-killing-kit/. Total Wine & More Plano East: Collin Creek Village, 721 N Central EXPY Ste 200, Plano. http://www.totalwine.com/store-info/texas-plano-east-collin-creek/505. North Central Texas College: 1500 North Corinth Street, Corinth. http://www.nctc.edu. Angelina’s Mexican Restaurant: 1400 North Corinth Street, Corinth. http://www.angelinastexas.com. Recycled Books, Records, & CDs: 200 N. Locust, Denton. http://recycledbooks.com. Comfort Inn & Suites Love Field-Dallas Market Center: 7138 N. Stemmons Fwy, Dallas. https://www.choicehotels.com/texas/dallas/comfort-inn-hotels/tx482. 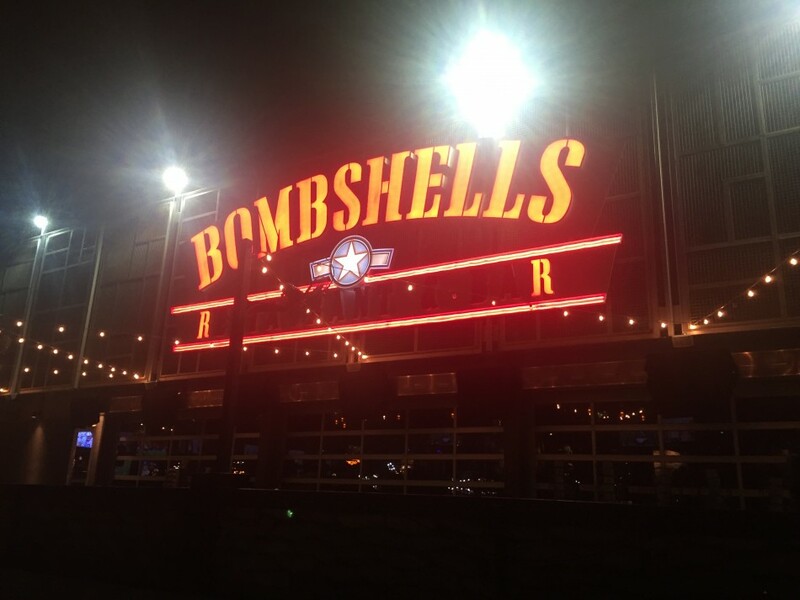 Bombshells Dallas: 7501 N Stemmons Fwy, Dallas. https://www.4bombshells.com/20005/locations.aspx. Jack in the Box: 7260 N Stemmons Fwy, Dallas. http://www.jackinthebox.com/locations/tx/dallas/75247. Starbucks: 2050 N Stemmons Fwy, Dallas. http://www.starbucks.com/store/16353/us/world-trade-center-dallas/2050-n-stemmons-fwy-dallas-tx-75207. Ripley’s Believe It of Not! Grand Prairie: 601 East Palace Parkway, Grand Prairie. http://www.ripleys.com/grandprairie/. 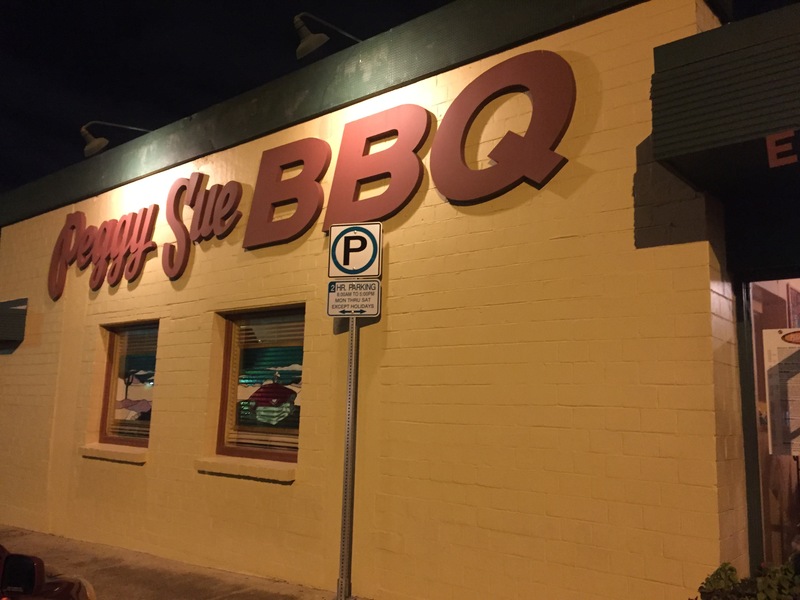 Peggy Sue BBQ: 6600 Snider Plaza, Dallas. http://www.peggysuebbq.com. Wendy’s: Terminal E, Dallas/Fort Worth International Airport. https://www.dfwairport.com/shops/finder.php?type=restaurants. Genghis Grill: Terminal E, Dallas/Fort Worth International Airport. https://www.dfwairport.com/shops/finder.php?type=restaurants. Squatters Airport Pub: Terminal 2, Concourse C, Salt Lake City International Airport. http://www.slcairport.com/dining-and-shopping/dining/squatters-airport-pub.